Continuing their ongoing diversity and inclusion work, the Parents’ Association Diversity & Inclusion Committee invited Alexis McGill Johnson from the Perception Institute to speak to parents. The Perception Institute created the racial-bias curriculum used by Starbucks during its nationwide stores shutdown on May 29, 2018 for a day of training. 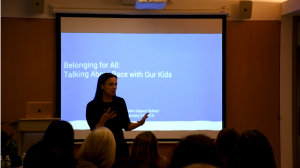 The talk at Gaynor on January 31, “Belonging for All: Talking About Race with our Kids,” was summarized thusly: “As parents, we strive to prepare our children for their future. Yet, research suggests that identity differences, such as race and ethnicity, can present challenges for us and our children, even when we hold strong egalitarian values.” Using research from the mind sciences, the talk used interactive games to illustrate several concepts as they relate to bias and perception. To start, Johnson presented parents with several different real-life scenarios and asked them how they would have handled the situations, encouraging opinions and feedback. She then proceed to illustrate the ways that we have subconscious bias, starting with the fairness paradox. “We believe ourselves to be fair but outcomes do not always support this.” Johnson then asked to the audience to reflect on their own lives. “We think we are diverse but are we really?” A slide prompted viewers to ask themselves questions including “What race are most of my friends? My children’s friends? People who come to my home?” Many were surprised when the majority of their answers were of their own race. Johnson also pointed out that rejecting explicit bias does not mean we are fair. Johnson had audience members take a Stroop Test. The Stroop Test is an interference test (see below) that asks subjects to name the color of the text, rather than the word. Many audience members answered correctly at first but as the test was sped up there were more errors. “We go back to the automatic processes that we have learned,” Johnson said. The test showed that our brains make assumptions within fractions of a second, even when we try to take our time to sort information properly. Johnson also asked that the audience reject colorblindness as a concept. Although it is touted as an aspirational and harmless ideal, when it comes to racial justice it is even more harmful. “It’s something for people to hold on to, but it’s not possible,” she said. Alexis is Co-Founder and Executive Director of Perception Institute, a consortium of social science researchers, law professors, and culture makers focused on the role of the mind sciences in developing interventions to address issues of bias and discrimination in workplaces and other key domains.